Food historians tell us the practice of stuffing (aka dressing, cramming) the cavities of fowl and other animals with mixtures of breads, spices and other chopped items is ancient. The Romans and the Arabs both employed such techniques. "Dressing" and "stuffing," as we Americans know them today, descend from Medieval European (English "forcemeat" and French "farce") culinary traditions. "Dressings and stuffings. Important as it is to America's festive culinary traditions, "dressing" is a term that wants some pinning down. Above all, whether it is interchangeable with "stuffing" is a matter of continual debate. On the one hand, insofar as "dressing" came into use in the nineteenth century as a prim euphamism for the latter term, we can assume it is equivalent. On the other hand, the verbs "to dress" and "to stuff" have historically connoted distinct culinary procedures--the one having to do with the cleaning and preparing of the carcasses of fish or fowl and the other with the making of fillings of all sorts. In this light, dressing might be viewed as a subtype in the more general category of stuffing, namely, one related directly to meat cookery--whereby filling the animal cavity with various ingredients woudl simply constitute a later step in the dressing process. This verb-based distinction accords to some extent with the popular notion that, technically, stuffing is the mixture actually inserted into the animal to be consumed, while dressing is the same mixture cooked separately, "on the outside." At any rate, "stuffing" is the dominant term, while "dressing" inheres in regional vocabularies, particulary in the South and Southeast. When it comes to recipes...dressing is all over the map. A central component of the Thanksgiving repast...it ultimately reflects all manner of culinary considerations, from basic technique to ethnic background and regional and national custom..."
How did early Americans stuff their turkeys? 1792, Truss your turkey as directed for roasting; make a stuffing as follows: take the crumb of a halfpenny roll, rub it through a cullender, a quarter of a pound of beef-suet chopped fine, some sweet herbs, parsley, and lemon-peel shred fine, grate in a little nutmeg, season it with pepper and salt, mix it up with a egg, and put it in the breast of the turkey, put the skin over and fasten it to the back with a skewer; spit it, singe it, and tie paper over the breast, put it before a moderate fire, and baste it well all the time it is roasting; when it is done take off the paper, baste it with butter, sprinkle a little salt on it, and dredge it with flour then take it up, put it on a hot dish, with good gravy, or brown celery sauce under it; garnish with lemon and beetroot, with onion and bread sauce in boats. A middling-sized turkey will take one hour and a quarter, bigger or less in proportion. N.B. You may stuff the breast with sausage-meat, or veal force-meat, as you like it best." Truss your turkey for roasting, take half a hundred of chestnuts, boil them till they are tender, peel them, chop half a dozen very fine, and put in the stuffing as above; take the marrow out of two beef marrow-bones, cut it into pieces, and stuff the belly of the turkey with the marrow and chestnuts; spit it, and tie the vent close to the spit with a string, singe and paper the breast, put it down to a good fire, and baste it well all the time it is roasting; then take off the paper, baste it with butter, sprinkle a little salt on it, and dredge it with flour, to make the froth rise; take it up, and put it into a hot dish; have ready a dozen of the chestnuts split into two, stew them in half a pint of brown gravy, a gill of white wine, two shallots chopped fine, thicken it with a little butter rolled in flour, boil it smooth, pour it in the dish; and garnish with lemon and beet-root, with bread sauce and gravy in boats. N.B. It will take a quarter of an hour longer roasting than without the marrow and chestnuts." In skillet, over medium heat, add sausage and beer. Cook until sausage brown and beer has reduced. Empty stuffing mix in a large mixing bowl, add melted butter, water and sausage. Mix well. Preheat oven to 350 degrees. Transfer the stuffing to a lightly greased baking dish. Add walnuts. Bake for 30 minutes. Enjoy! Beer in stuffing. I've never done it but it bet it is soooo good! Yumm! 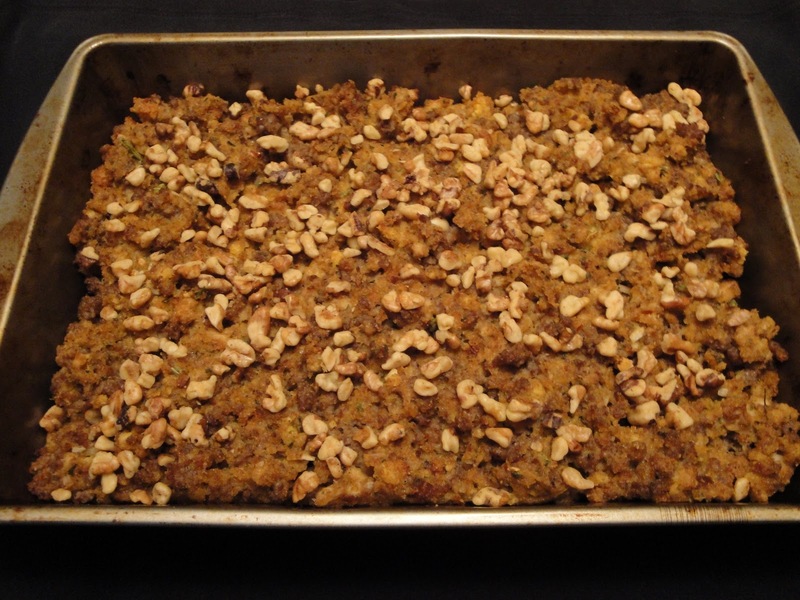 This looks like a great stuffing, perfect for the season! Yum, this looks so delicious! I love stuffing, or dressing, whatever you want to call it :) I think they're so perfect for this time of year, and I really want to try a sausage one like this! 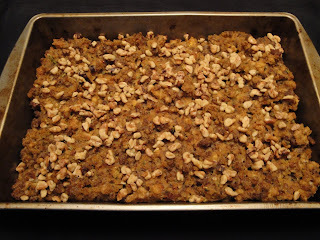 What a great stuffing recipe! Very cool recipe Christine. Love the sausage and beer in it. I hate beer to drink but it rocks for cooking. Like you, I'm not a beer drinker but love to cook with beer. Beer and sausage wow this is a hit for sure in my household got to try this on my bookmarkings of favorites to try thanks Christine! I love, Love, LOVE stuffing! One of my favorite things about the holidays!